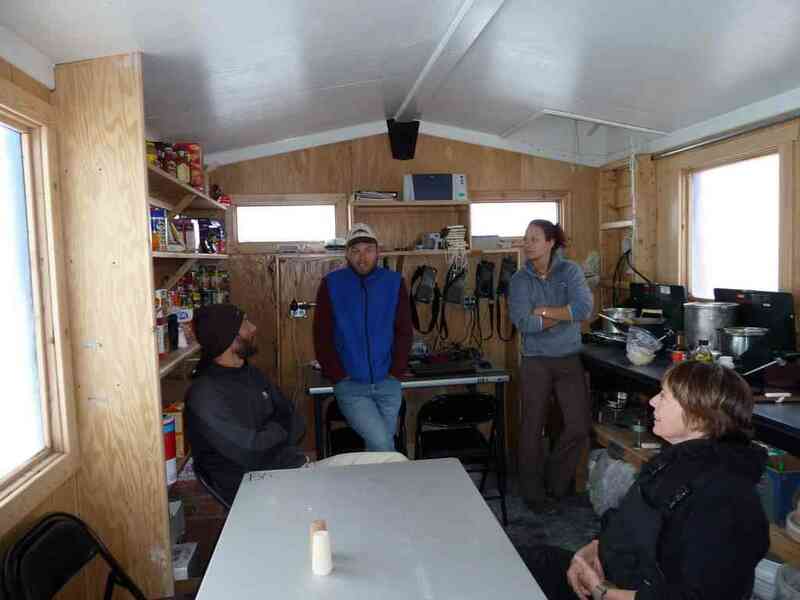 The Center of Excellence (the outhouse), so named by the McMurdo carpenters who constructed all of our huts, making them extremely comfortable, liveable, and warm. Note Big Razorback Island and the blobs of seals on the ice at the head of the island. It's 2 am. I have to go pee. I try not to bang my head on the ceiling or do a body slam on the floor as I groggily crawl and ease myself down from the top bunk in the men's sleeping hut. I slip on my down booties and open the door. "Aaahh! my eyes!" I exclaim (quietly and to myself, since everyone is sleeping). Bright light harshly greets my blinking eyes. "Huh...the sun is shining." This surprise is met by another, and just as fiercely. It's FREEZING outside. I run towards the bathroom (called the "Center of Excellence"), making sure to glance up at Mt. 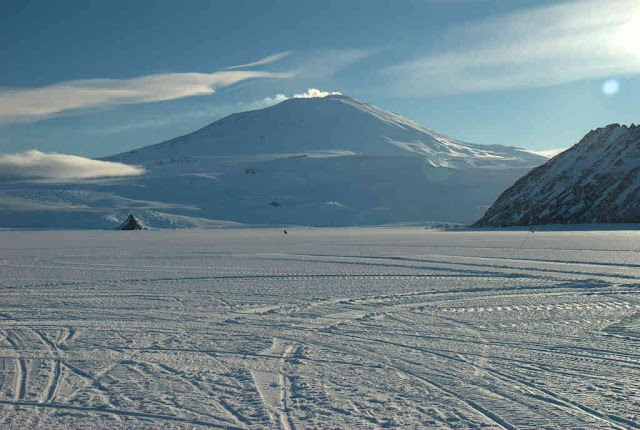 Erebus, glowing in the sun, a small wisp of steam coming from the volcano's crater. 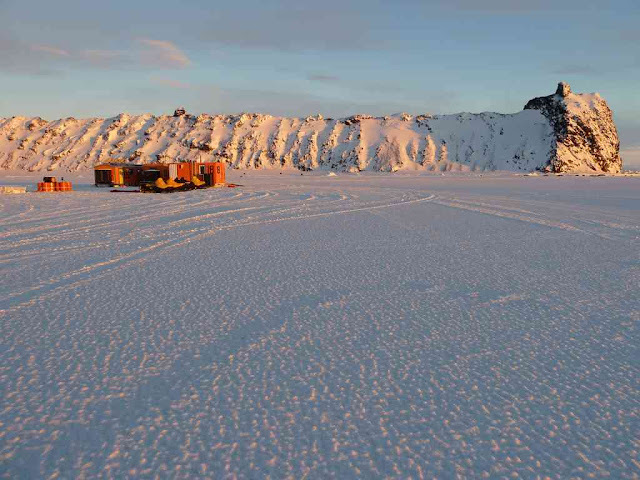 Crunch, crunch, crunch...I keep running...crunch, crunch, crunch...the sound always reminding me that I'm walking on sea ice overlaying, well, the sea (and who knows how deep). To my right a subtle, distant moan reminds me that we have neighbors. Twenty seals lay sprawled out on the ice, all doing absolutely nothing aside from the occasional flipper twitch, or belly scratch, or belly roll. The fractures and cracks in the ice formed along Big Razorback Island providing their only outlet to the "upper world," the seals can be seen chillin' on the ice at all hours of the day. 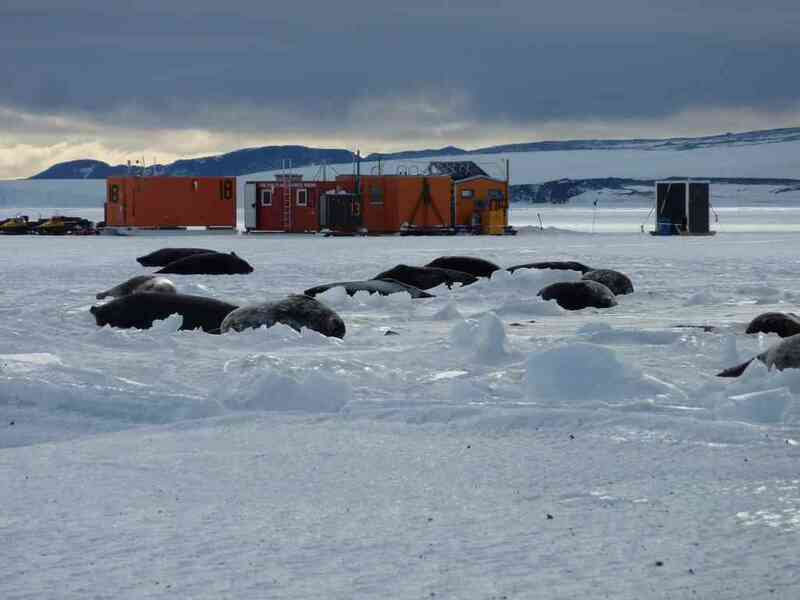 Such is the life of the Weddell seal researcher. 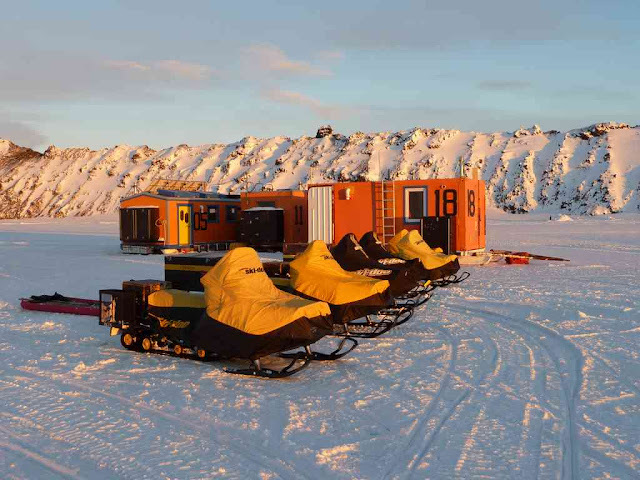 Twenty-four hour sunlight, freezing air temperatures, awe-inspiring views, expansive ice, and seals. Throw in the occasional white-out storm and 40 mph winds, and that's Antarctica. 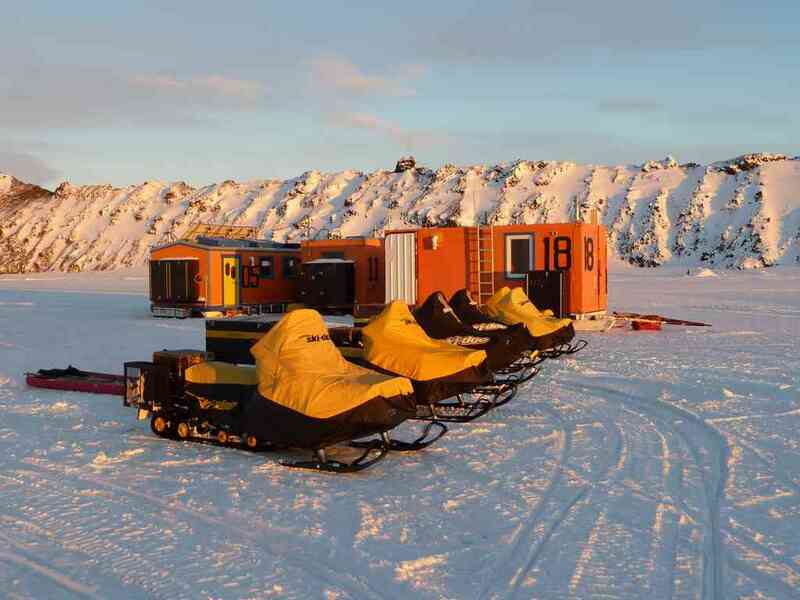 Field camp is finally all set up now, the finishing touches being the wireless internet and phone. Camp consists of five huts: a kitchen hut, equipment hut, ladies sleeping hut, mens sleeping hut, and outhouse. All the huts (minus the outhouse) are heated with propane gas...which is a welcome relief after a long, cold day riding snowmobiles and finding seals. All the electricity, used to run all of our technical equipment (computers, chargers, etc), is obtained by borrowing a few of the sun's rays via solar panels. We have enough hot cider to last us a couple of years (ok, that's an over-exaggeration), an espresso maker (which we scavenged from "Skua," a second-hand depository for those leaving McMurdo station who don't want to take their clothing or equipment back to the States), and even have a barbecue grill for the occasional hamburger dinner. We are each provided with a snowmobile to cross the huge distances across the sea ice. The huts: #5 kitchen hut, #11 equipment hut, #13 ladies hut, #18 (below) mens hut. Mt. 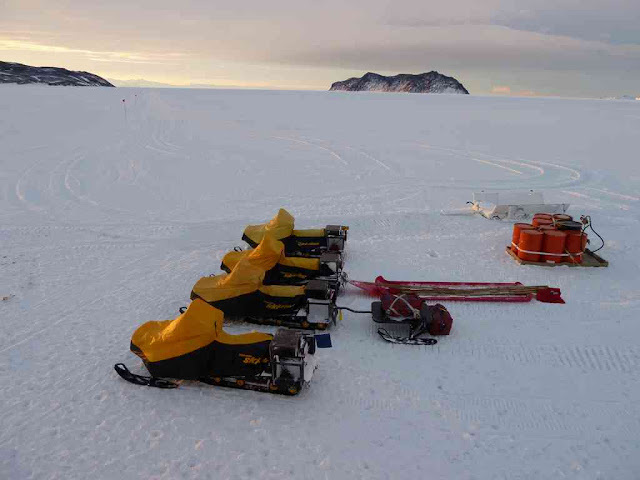 Erebus half-lit in sunlight in background left, Big Razorback Island in background right. Tent Island to the left, Inaccessible Island to the right. Inside the kitchen hut...the social gathering spot. If you came back to this spot a day later, they would hardly have moved. 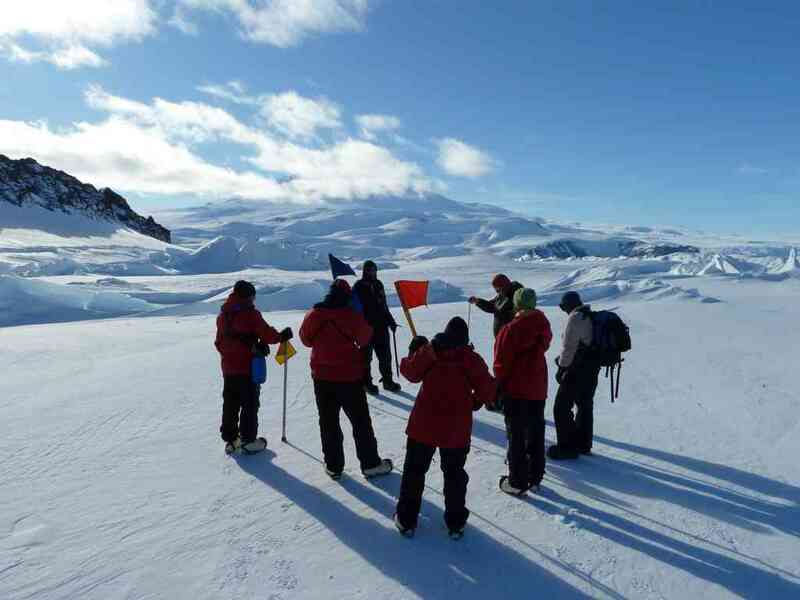 Being in Antarctica means lots of training (for safety), and we have finally gotten all trained up. Theirry and I had to take Sea Ice training, a half day course on determining what cracks in the ice are safe to cross on vehicles. 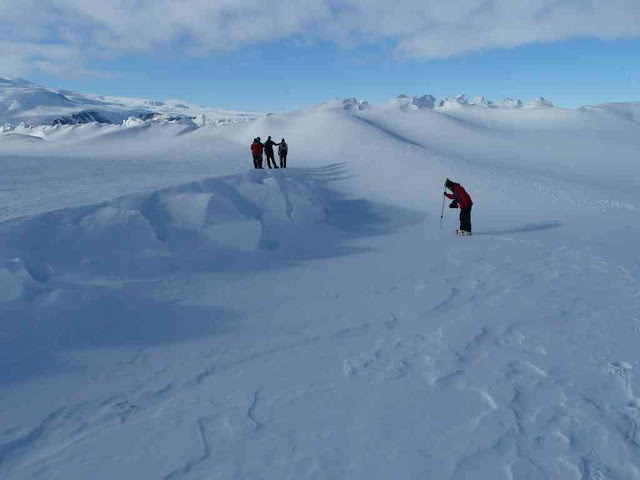 Then, our entire crew took Pressure Ridge training, another half day lesson on walking and working in areas of uplifted and contorted ice where cracks in the ice abound. Normally, participants in the Antarctica Program don't have to take this second course, but since the seals that we study are usually found in the cracks and pressure ridges, FSTP (known as "f-stop" or Field Safety Training Program) specially created this course for us. 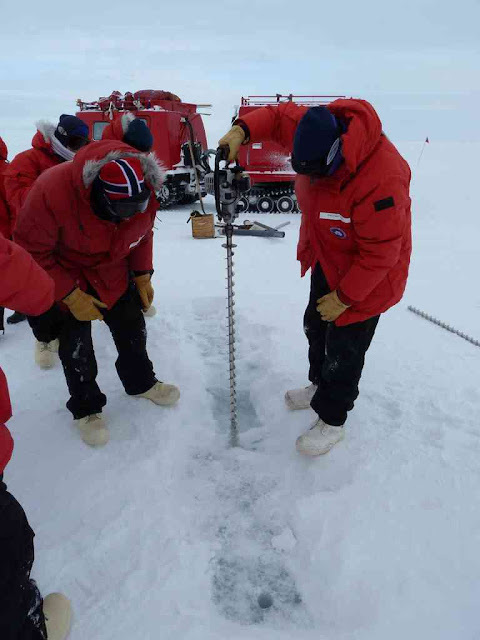 Drilling to check the depth of the ice near a crack. Theirry on left. 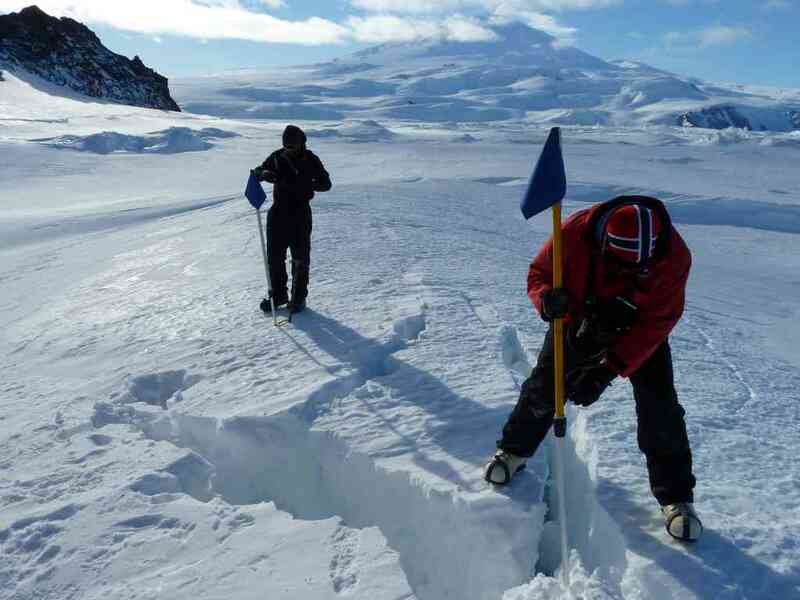 Pressure Ridge training...everyone equipped with a probe or an ice axe. Pressure ridges galore in the background. Poking around cracks in the pressure ridges. This ridge is probably about 10 feet above the sea....don't want to fall in one of those cracks! More poking about...we do lots of ice poking around here. Travel through such places can be safely accomplished with diligent poking. Our research is off to a good start...we've tagged a couple dozen seals (adults and pups)...but more about that later...! Jesse, these are fascinating photos both indoors and out. And delightful reportage as always. It is interesting to see all the emphasis on safety. You look like moon explorers and I wouldn't be surprised a bit if that was your next assignment. You also look like you are all freezing even inside your kitchen box. Though we assume there is a hot tub somewhere out back that you are not supposed to mention. Un petit bonjour pour ton collegue francais, and thank you for sharing your amazing experiences with us. Can't wait to read about tagging the seals. Why is it called Inaccessible Island? Is it actually inaccessible? Wendy: No hot tub this time...but the huts are very warm. Actually too warm sometimes! The sleeping hut gets unbearably hot at night sometimes. 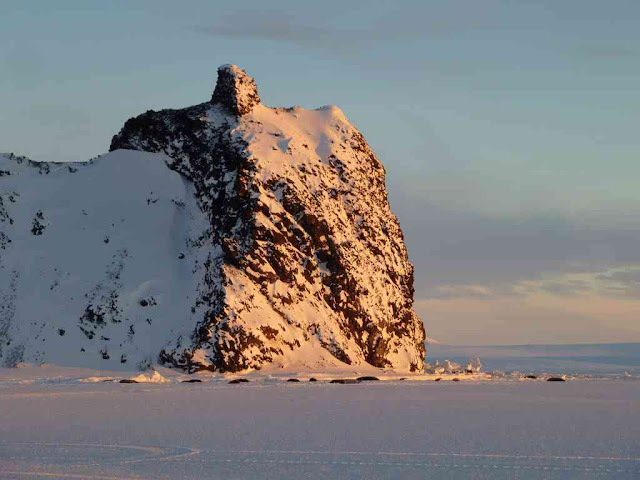 Bonnie: The island was named, yes, because of its inaccessibility, but that was in the early 1900's (by Robert F. Scott's Discovery expedition). Right now, I could drive my snowmobile to it, hop over a crack, and be on it. I'm sure Scott was there when the sea ice was partially broken up and extremely dangerous making access impossible. It's a good thing Luke's not with you. Undoubtedly, you'd be hatching a plan to climb Erebus. Poke on! An email reply from Antarctica! My day/week/life is complete :-) . 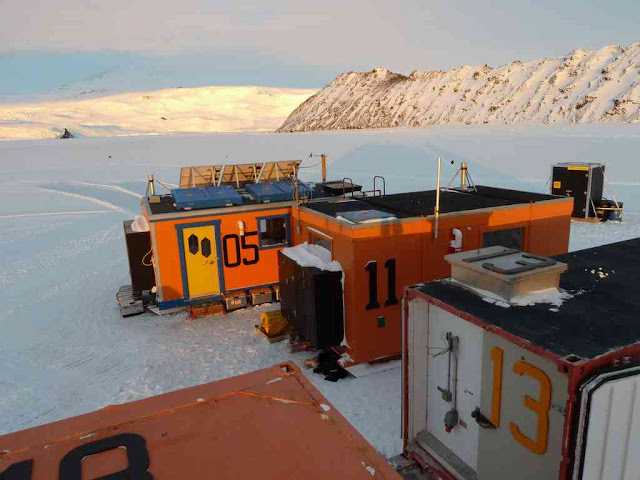 Wendy: We fortunately have a window that opens, but what we've discovered is that a very nice "thermocline" develops inside the hut when it is open, meaning those of us on the top bunk are warm, while those on the bottom bunk freeze. It is a very challenging situation. Jesse, Jesse! What a writer/photographer you are! I giggle to remember the tiny little Jesse we were concerned about because he didn't talk. You were saving up those words, weren't you?! Your descriptions make me think of my Arctic adventures when we were in total darkness, the opposite of you now. Is this the Mary I think it is? Tiny little Jesse was a great talker. He was just in awe of you!